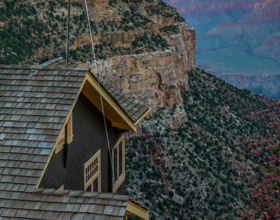 Planning a one-day trip to the Grand Canyon? Use our itinerary planner to ensure you experience as much as possible. You can have a lot of fun at the Grand Canyon, even if you don’t have a lot of time. 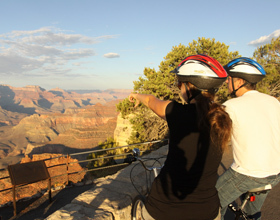 Walk the rim, ride the shuttle bus to the scenic overlooks, explore historic Desert View and more. 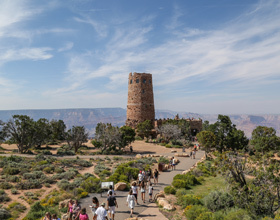 The Grand Canyon boasts a number of visitor centers, museums and historic buildings, each with unique perspective on this special place. 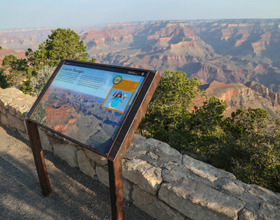 Highlights include a 3-D map at the National Park’s main visitor center, Yavapai Geology Museum, the Kolb Brothers’ photography studio and more. Visit the Desert View area with its iconic, Native American-inspired watchtower, Indian ruins and museum dedicated to the ancient Pueblo Indians. There are free shuttle buses operating on various routes, which allow you to get on and off at different overlooks, museums and more. 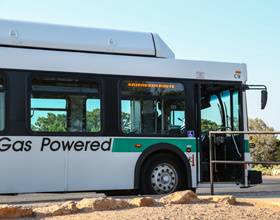 The shuttle buses also provide access to a number of hiking trails and cycling routes. If you’re looking for a pleasant way to see the sights and get some exercise while you’re at it, this is it. You even get the opportunity to explore parts of the park that are closed to cars. Bicycles can be rented or you are welcome to bring your own bikes to use on the Greenway Trail and other designated bike paths. 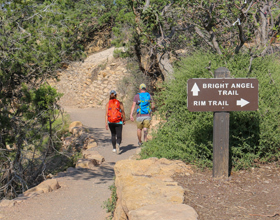 Rim Trail, Bright Angel Trail and South Kaibab Trail are great places to start if you’re looking for a one-day hike. Hermit Trail and Grandview Trail offer more challenging hikes. Be sure to read up on hiking tips and ways to "hike smart" before you begin your hike. Sunrise and Sunset are two of the most beautiful photo opportunities at the Grand Canyon. But that’s just the beginning. 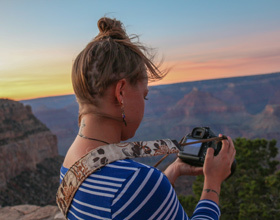 The Grand Canyon is a photographer’s paradise, whether you’re using a professional-grade camera or just taking selfies near the rim. The Junior Ranger program is a great way for your kids to have fun and learn at the same time. They’ll attend a program led by a real park ranger, receive a free activity booklet at the Visitor Center with age-appropriate tasks, and get a badge upon completion.